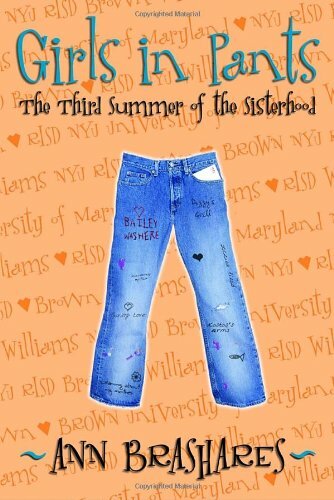 It’s the summer before Tibby, Carmen, Lena, and Bridget go off to college; their last real summer together before they part ways to start their own lives. This summer, the girls need their Traveling Pants the most. Once upon a time, (two summers before), the four girls had found a “magical” pair of pants, that miraculously fit all of them perfectly, even though they are all different shapes and sizes. The pants were wise and magical, and the four girls named them The Traveling Pants. The Pants not only taught the girls how to be apart physically, but together mentally. They taught them to love themselves as much as they loved each other. The summer the Traveling Pants appeared was the first summer the girls would ever be apart. Lena went to Greece, Bridget went to soccer camp, Carmen visited her dad, and Tibby stayed home. They formed a sequence in which the Pants would travel. One girl sent the Pants to another, who wore them for a week. Then she would send them to the next girl, who would wear them for a week. When the girls received the Pants, they would decorate them or write on the Pants something magical that happened while wearing them. Now, it’s the last summer before the girls go off to college, but the thing that ties them all together, even when they are apart, are the Pants. Carmen needs all the Pants’ magic she can get, when she agrees to watch Lena’s cranky, homesick grandmother. Lena wishes that the Pants could tell her if it’s a wise decision to go to art school, even if her family doesn’t support her. Bridget is lucky to have the Pants with her at soccer camp when she finds out who she is coaching with. Tibby learns that there has always been something the Pants know about her boyfriend, Brian, even when she had no idea. The first night, in their secret meeting place, the four girls would launch the Pants on their third summer voyage. Girls in Pants is the third-installment of the Sisterhood of the Travelling Pants series. This book was very well-written, and the characters have qualities that a lot of girls can relate to, such as insecurity, ambition, and fearlessness. This is important because it shows girls that they aren’t the only ones who feel that way. It was interesting to see what the girls decided to do in certain situations, and connect it to what I would do. For example, when Bridget liked a boy at soccer camp, she flirted constantly and tried to impress him. If it were me, I would have avoided him at all costs. The only complaint I have about the book is Carmen’s attitude, she’s really single-minded sometimes and cares more about how things affect her than others’ happiness, for example, when her mother gets married. She was upset because she wanted to have her mother all to herself, which I find dramatic and irrational. Nevertheless, the book was fantastic and I look forward to reading the final book of the series!